Fleischmann, Bachmann, Kato, Life-Like, Athearn, Walthers, Fox Valley, Atlas, Con-Cor and more. 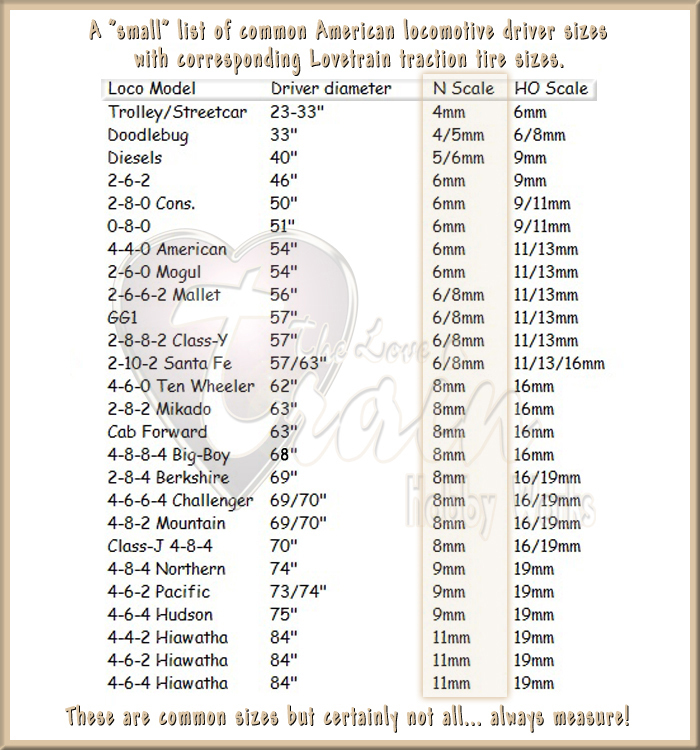 The N Scale Traction Tire Size Chart, along with some other scale traction tire illustrations below, may be helpful! LIFETIME LIMITED WARRANTY - Our guarantee that a product will be replaced at no charge if found defective (See Terms & policy link below). 30 DAY MONEY BACK GUARANTEE!! - Simply ship it back with the receipt within 30 days of date shipment was received for a full refund. We WILL get you on the right track! 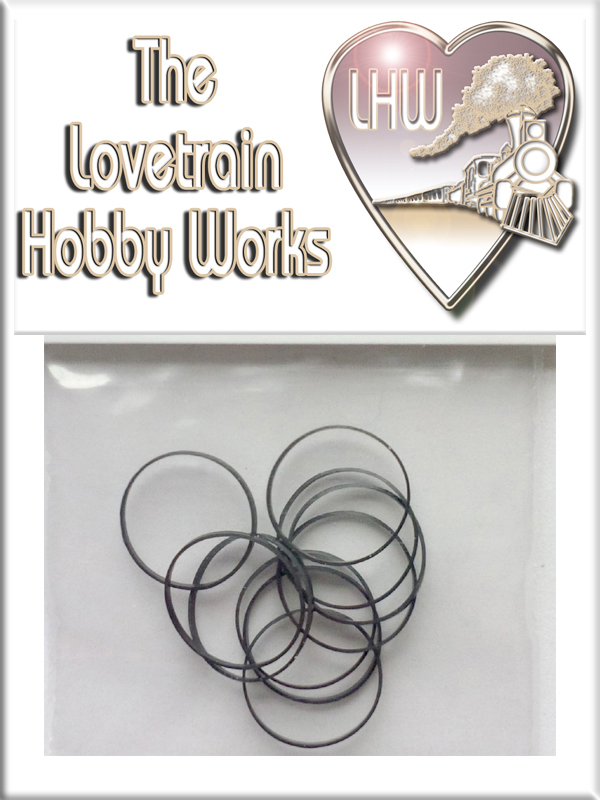 The Lovetrain Hobby Works thanks you for your interest. 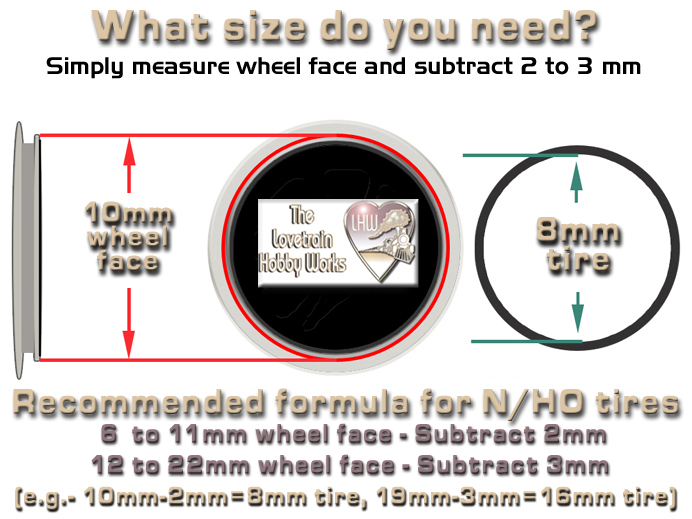 How are these N scale traction tires different? 1. Has to be low profile. 2. Has to be compatable with most N scale equipment. 3. Has to provide sufficient traction and pulling power. 4. Must be rugged and endure hour after hour of locomotive running. 5. Must be affordable and available at all times. 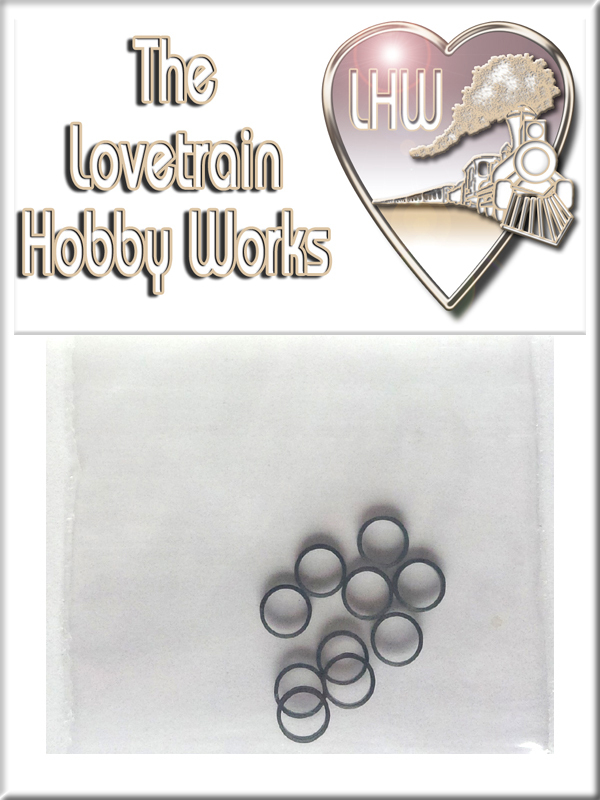 Our N scale traction tires (diesel-electric-steam) are low profile. 1. 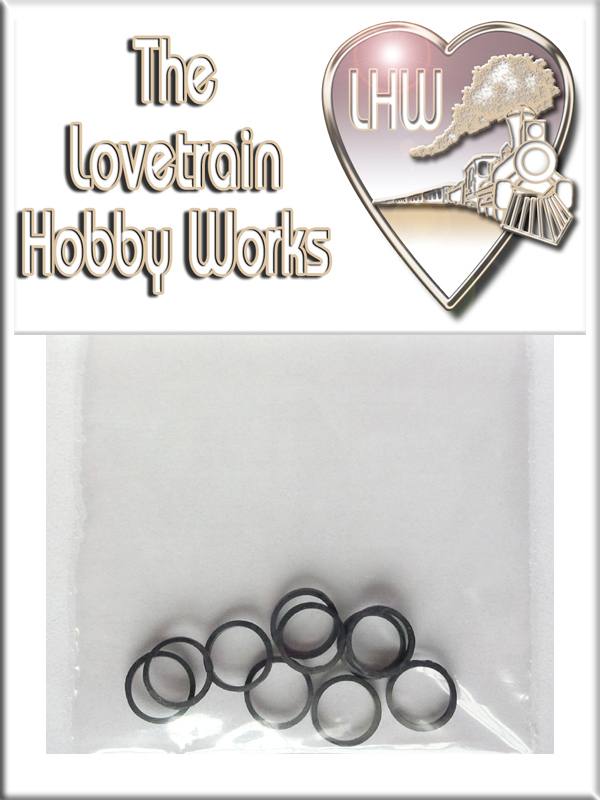 Allows the flanges of your locomotive wheels to maintain allignment between the rails. Thick tires can increase locomotive likelyhood to jump the track. 2. 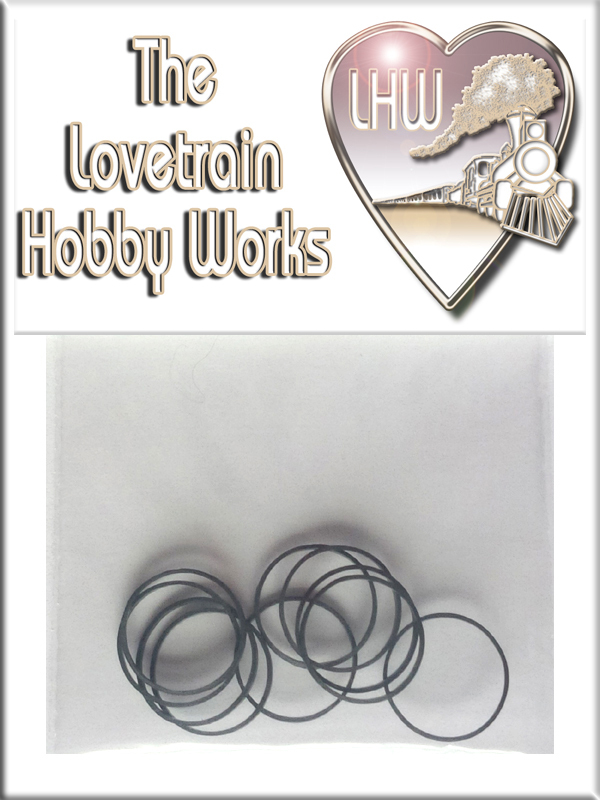 Allows freedom of movement past the brake shoes of steam locomotives. 3. Enables powered drivers to maintain contact with the rails. with most N scale equipment. 1. 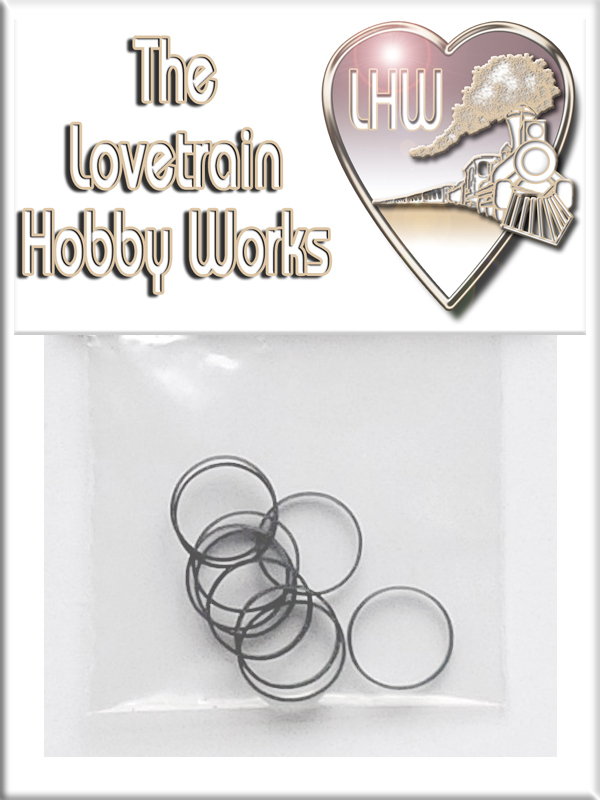 Model railroaders usually acquire various brands and styles of equipment. 2. 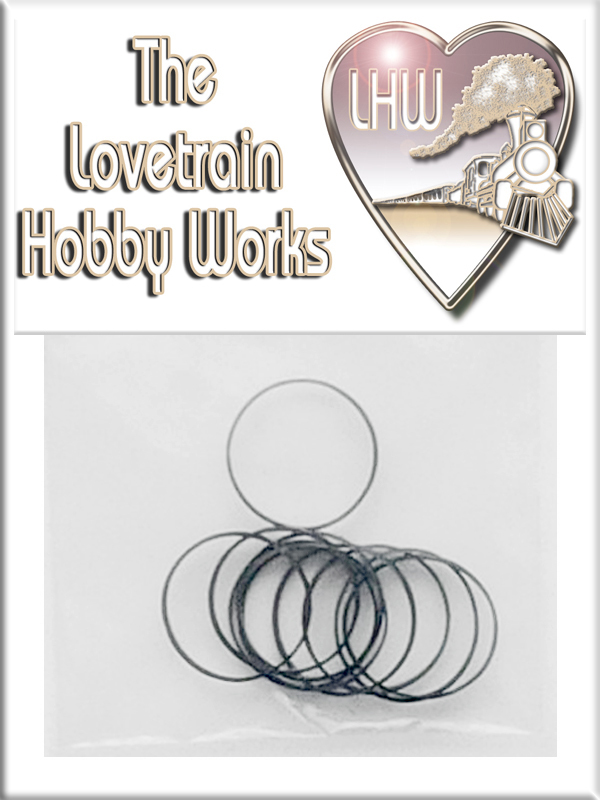 Model railroad locomotive manufacturers often do not have traction tires available. 3. Shopping around is no longer necessary... it's all right here. pulling power to rival manufacturers brand. 1. When you buy replacement traction tires they need to work. It's no fun to keep changing them out. it just loses something... right? and more resistant to solvent breakdown. 1. Again... When you buy replacement traction tires they need to last a bit. 2. We all have to clean our track and well... sometimes it's a solvent. (WARNING!) - Some strong solvents MAY/WILL cause unknown adverse effects. Rubbing alcohol (and a lil' elbow grease) on a regular basis is suggested. 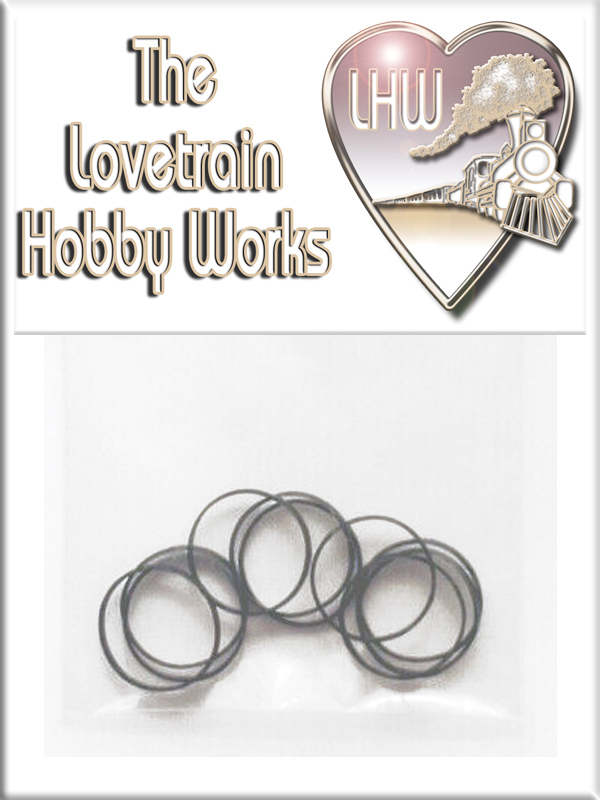 Our N scale traction tires (diesel-electric-steam) are affordable and available. 1. Because we're not made of money right? 2. Because acquiring quality traction tires can be a harshly unrealized endeavor. We know it all too well. acceptable to provide a more accurate experience. Because when you add it all up... it just makes sense. We are confident you will love them! 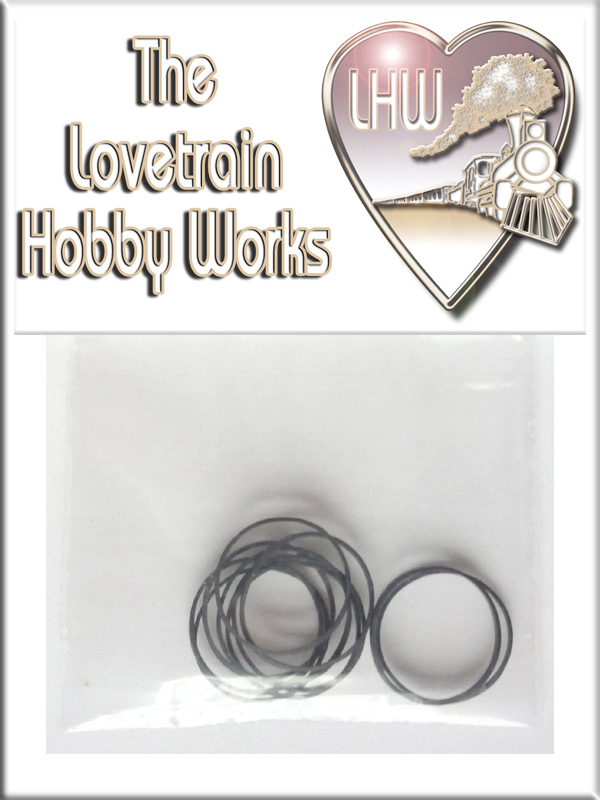 The Lovetrain Hobby Works - God bless! N / HO Scale Traction Tires. HOW TO... RECOMMENDED INSTALLATION TECHNIQUE (For best results). N / HO Scale Traction Tires. 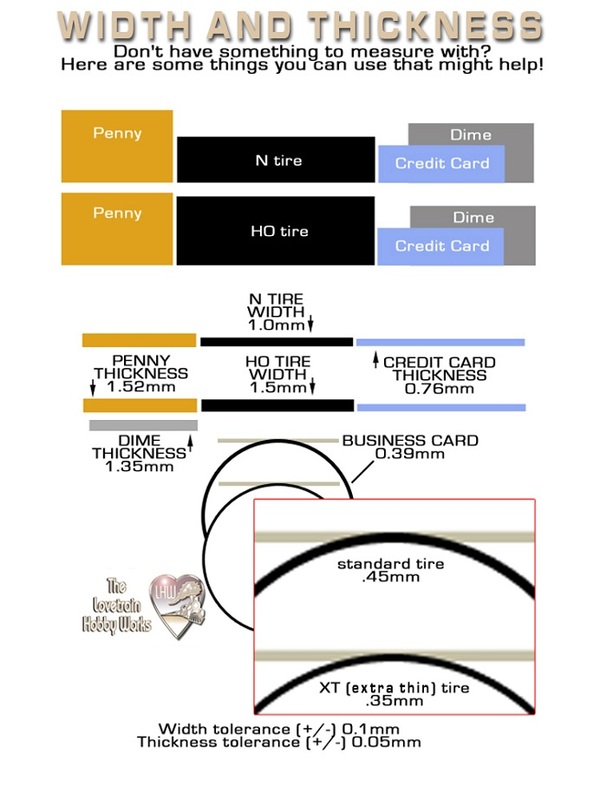 How to install your new traction tires to get the best fit possible. BACHMANN 2-6-2 PRAIRIE N scale 6mm traction tires steam-diesel, Pairie Hustler Video Clip (FUN). N scale 6mm traction tires steam-diesel, Pairie Hustler Video Clip. Bachmann 2-6-2 Prairie. 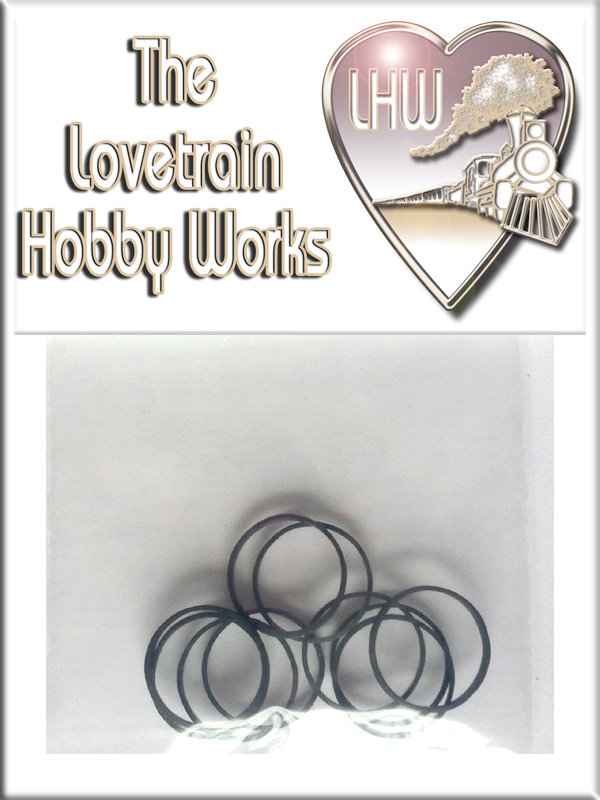 ATHEARN 2-8-0 CONSOLIDATION 6mm traction tire video. N scale 6mm traction tires. 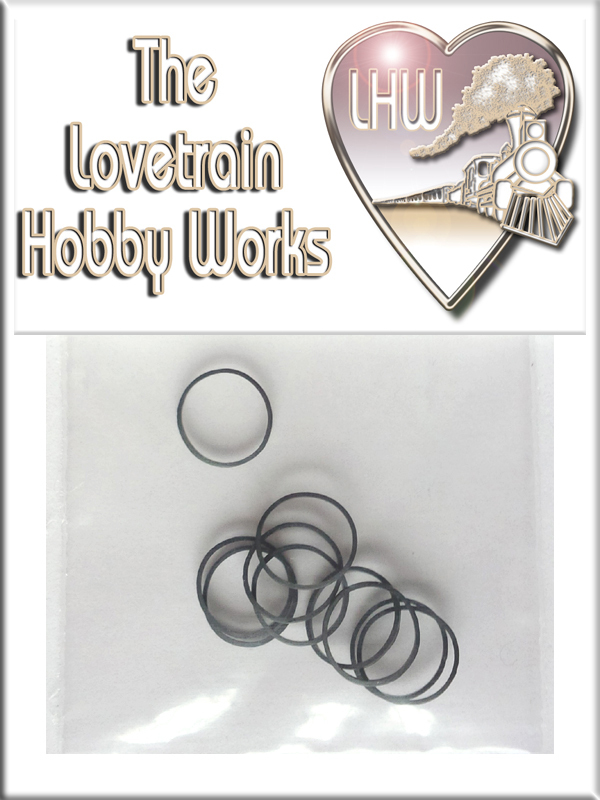 BACHMANN LIGHT MOUNTAIN 4-8-2 8mm traction tire video. N scale 8mm traction tires. 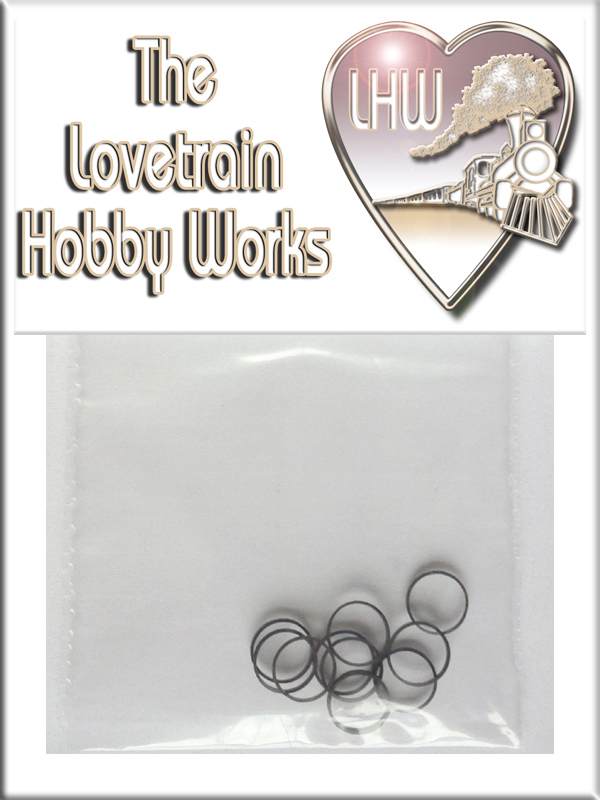 N scale 8mm traction tires, steam medium 8mm-proof in the pudding video. Bachmann Light Mountain 4-8-2. N scale 8mm traction tires, steam medium 8mm video. Bachmann Light Mountain 4-8-2. BACHMANN CLASS-J 4-8-4 8mm-proof in the pudding video. N scale 8mm traction tires. 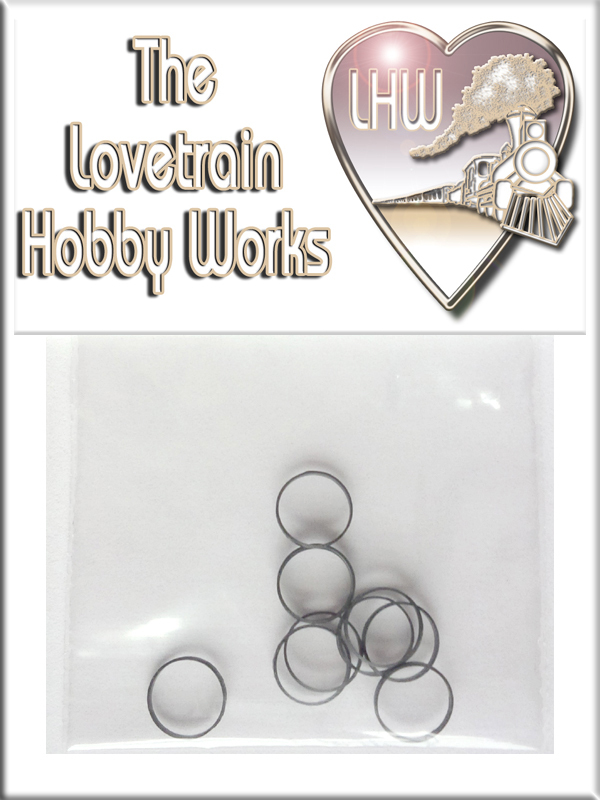 N scale 8mm traction tires, steam medium 8mm-proof in the pudding RAW video. Bachmann Class-J. BACHMANN CLASS-J 4-8-4 8mm traction tire video. N scale 8mm traction tires. 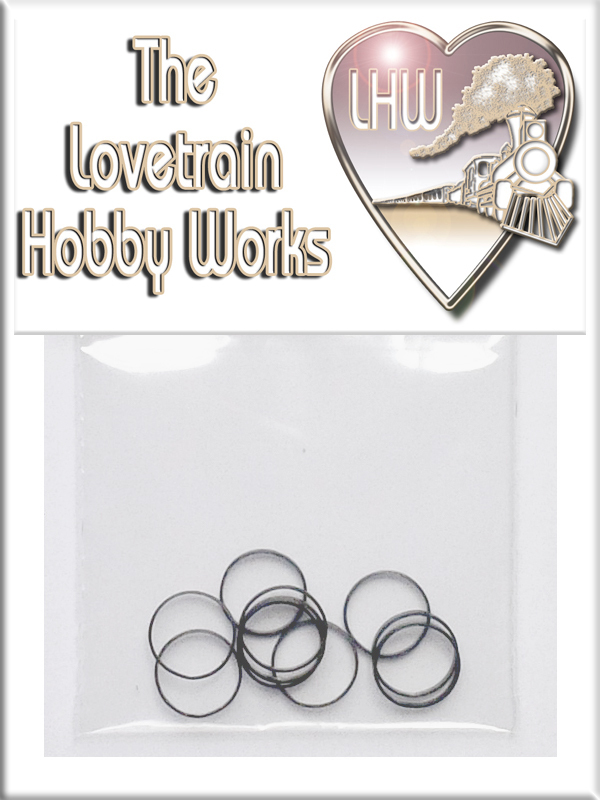 YOUTUBE VIDEO CHANNEL - N Scale Traction Tires for diesel-electric-steam. Locomotive engines in action. 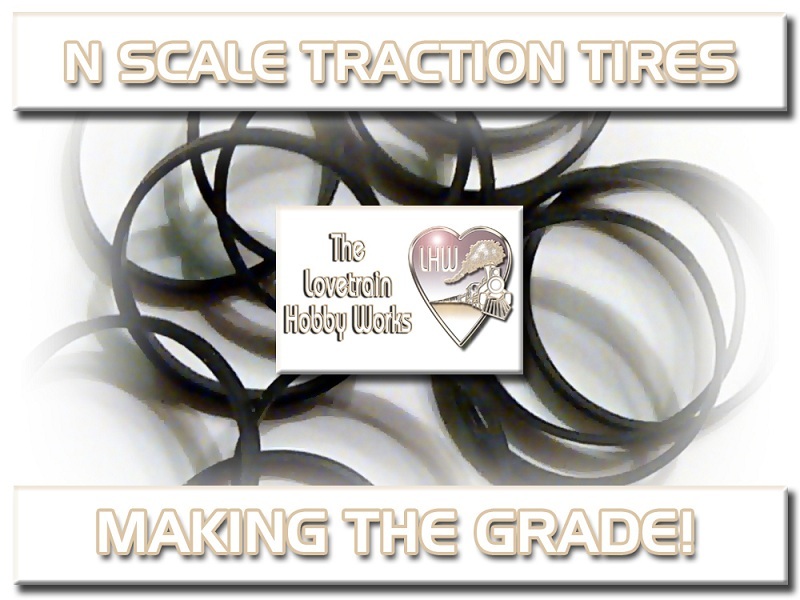 N Scale Traction Tires. 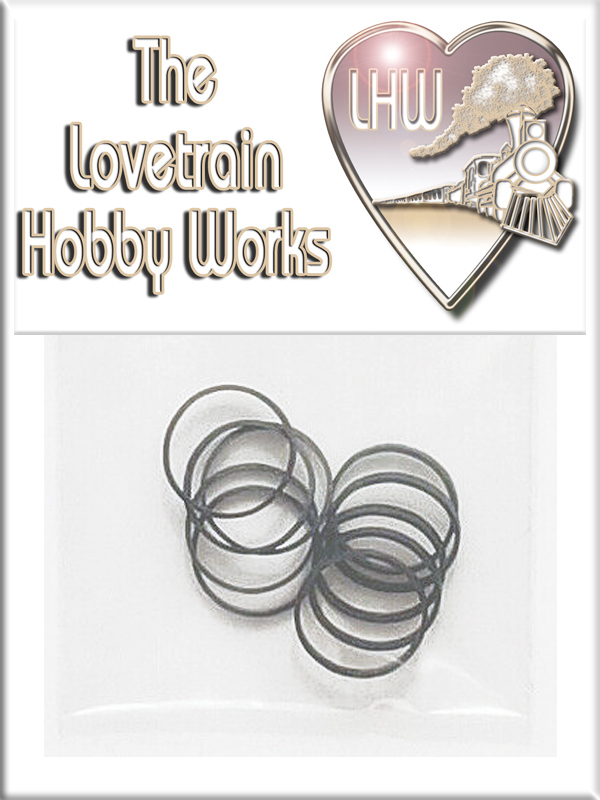 The Lovetrain Hobby Works YouTube Channel - diesel-electric-steam locomotive engines (various clips). HO scale traction tires - Diesel-Electric-Small Driver Locomotive, 6mm. 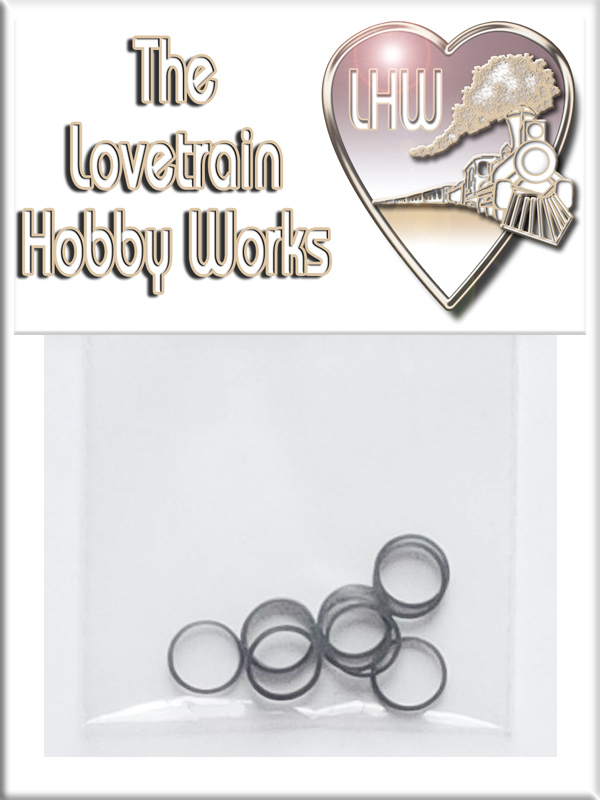 HO scale traction tires - Diesel-Electric-Small Driver Locomotive MEASUREMENTS 6mm. HO scale traction tires - Diesel-Electric-Small Driver Locomotive, 8mm. 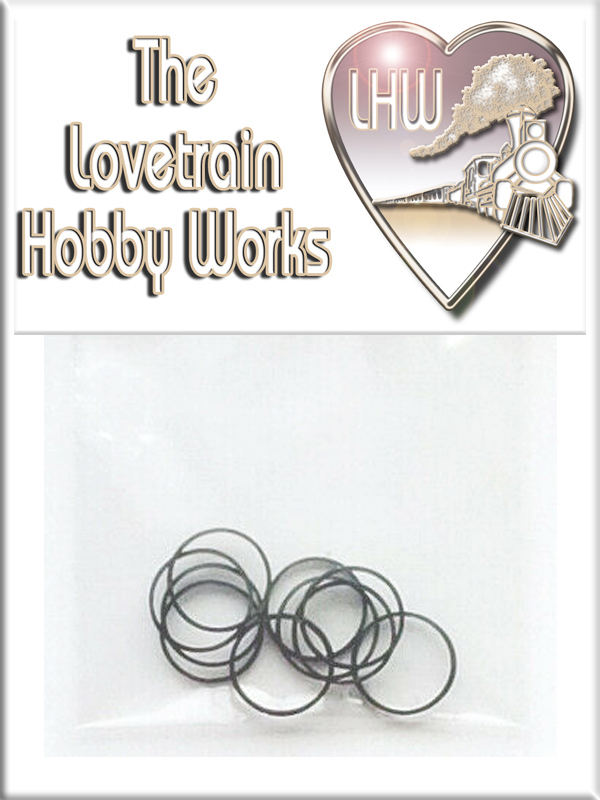 HO scale traction tires - Diesel-Electric-Small Driver Locomotive MEASUREMENTS 8mm. HO scale traction tires - Steam-Diesel-Electric-Small Driver Locomotive, 9mm. 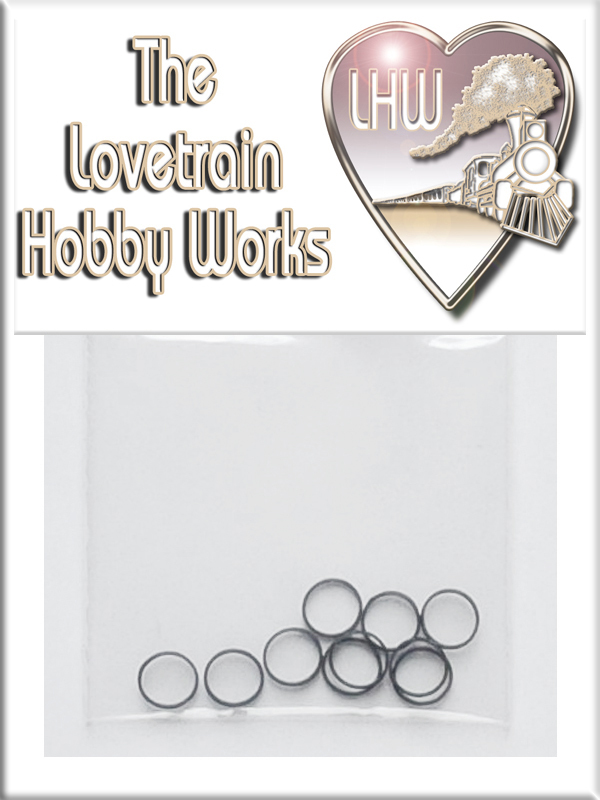 HO scale traction tires - Steam-Diesel-Electric-Small Driver Locomotive MEASUREMENTS 9mm. 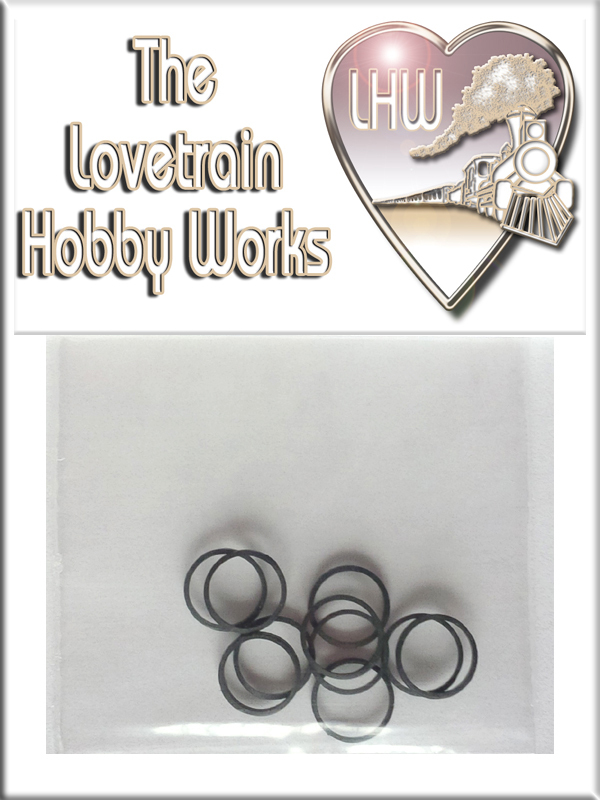 HO scale traction tires - Steam-Diesel-Electric-Small Driver Locomotive, 11mm. 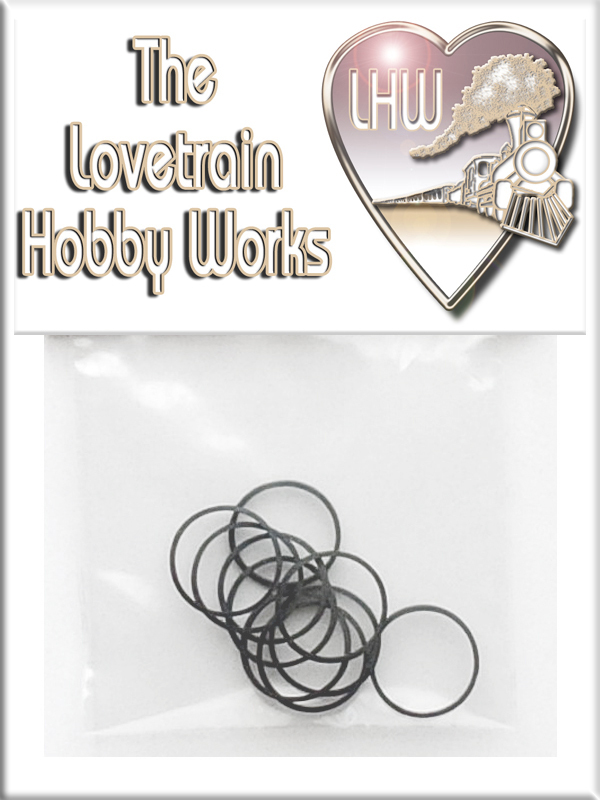 HO scale traction tires - Steam-Diesel-Electric-Small Driver Locomotive MEASUREMENTS 11mm. 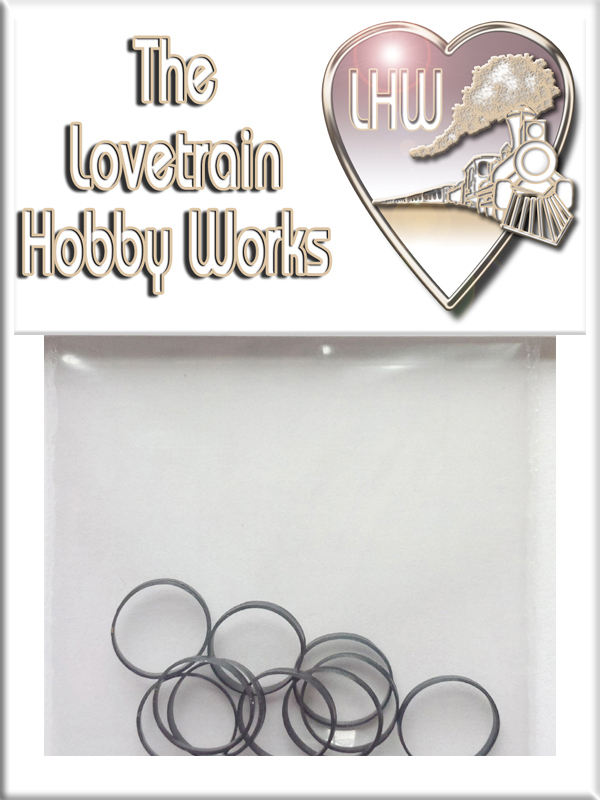 HO scale traction tires - Steam-Diesel-Electric-Medium Driver Locomotive, 13mm. 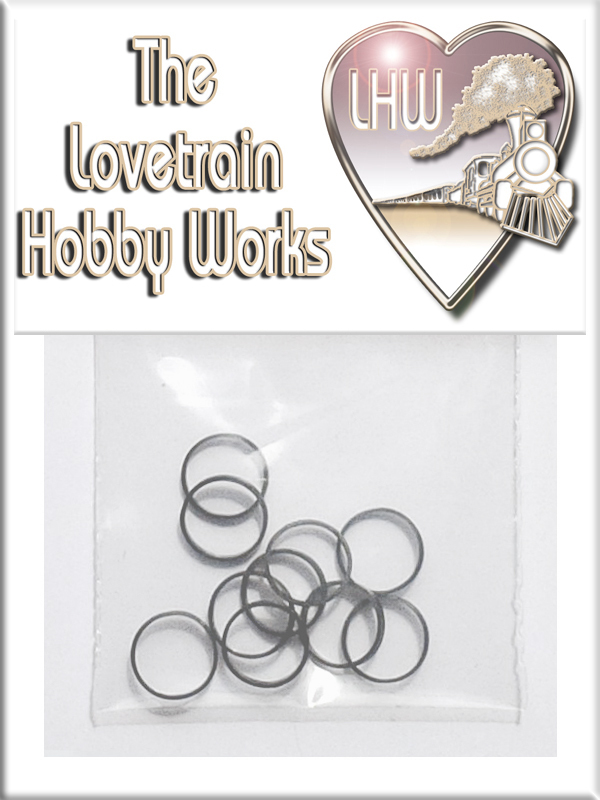 HO scale traction tires - Steam-Diesel-Electric-Medium Driver Locomotive MEASUREMENTS 13mm. 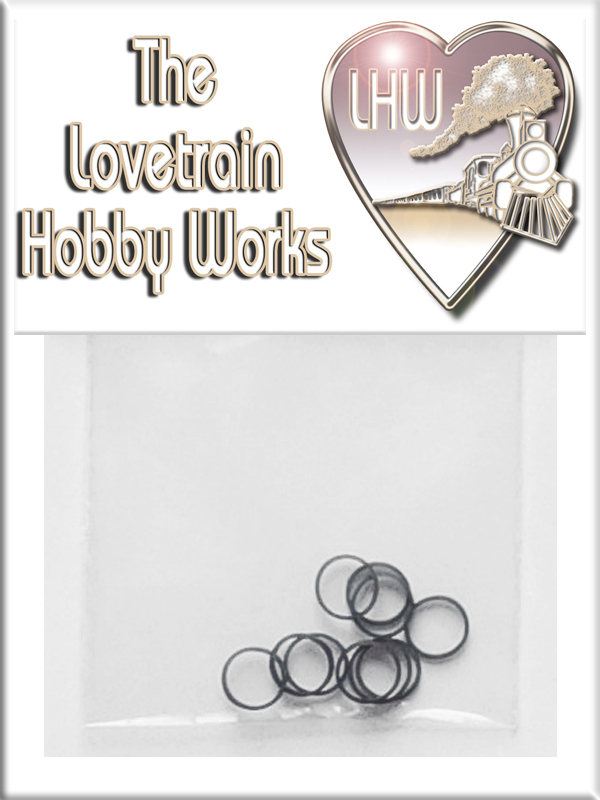 HO scale traction tires - Steam-Medium Driver Locomotive, 16mm. 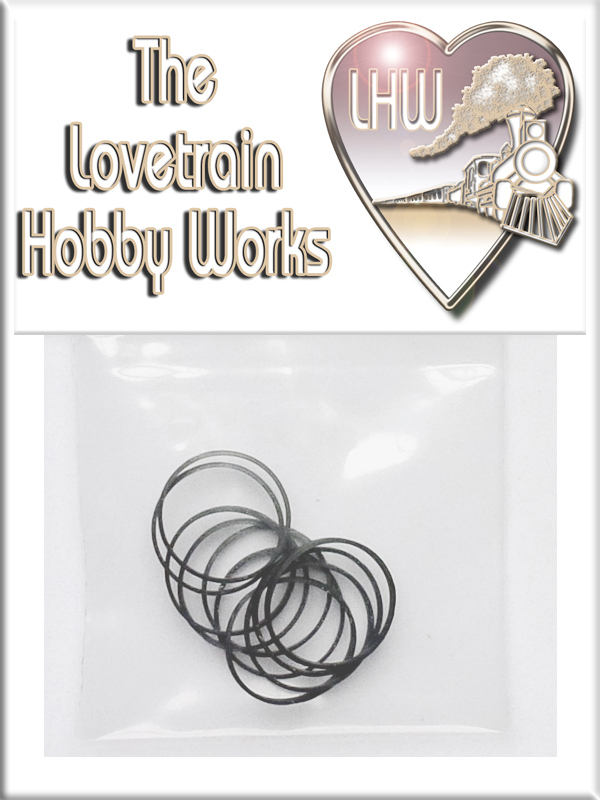 HO scale traction tires - Steam-Medium Driver Locomotive MEASUREMENTS 16mm. 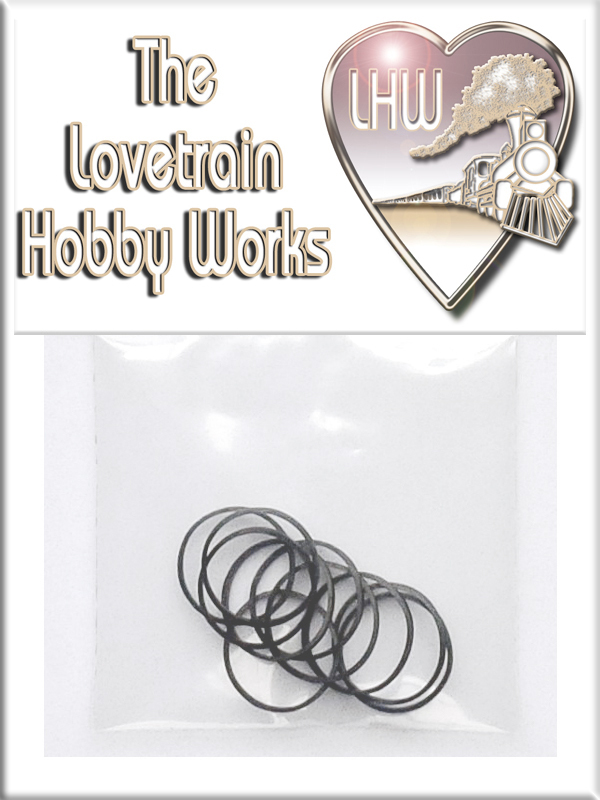 HO scale traction tires - Steam-Large Driver Locomotive, 19mm. 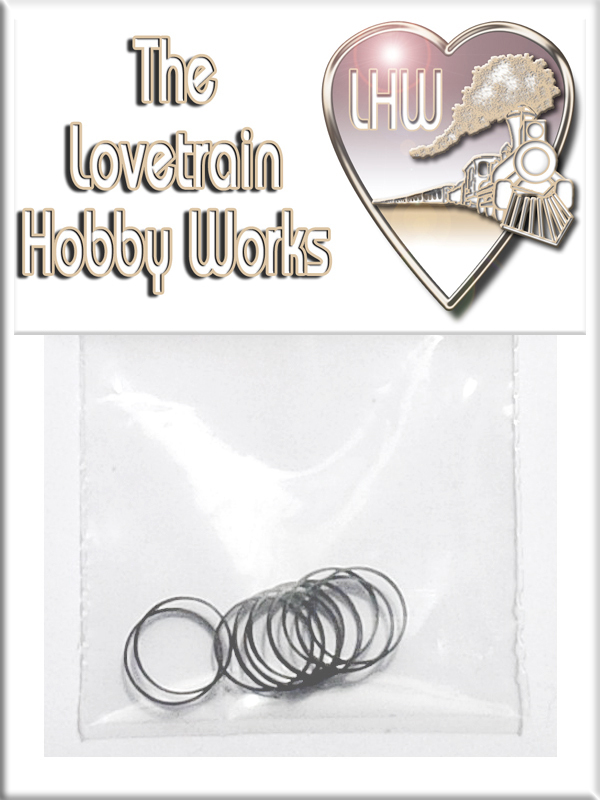 HO scale traction tires - Steam-Large Driver Locomotive MEASUREMENTS 19mm. 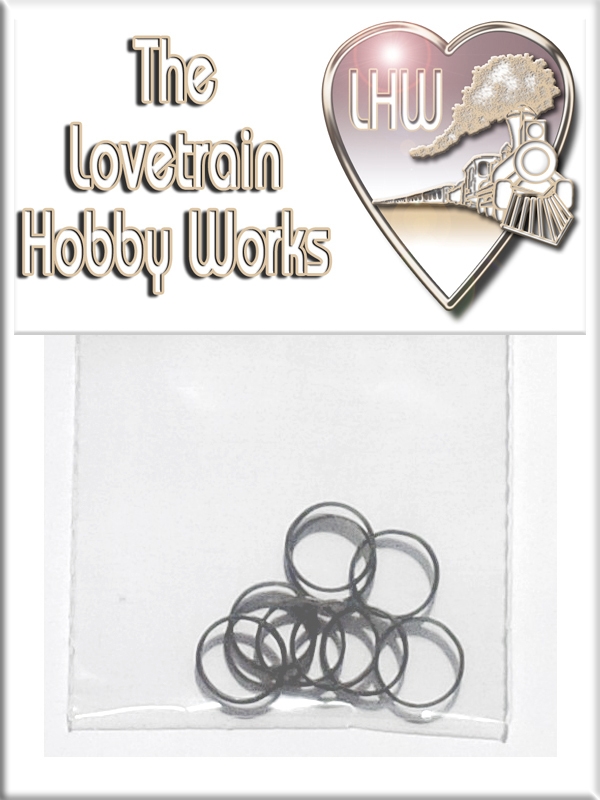 N scale traction tires - Steam-Diesel-Large-Medium-Small Driver Locomotive, 6mm, 8mm, 9mm. 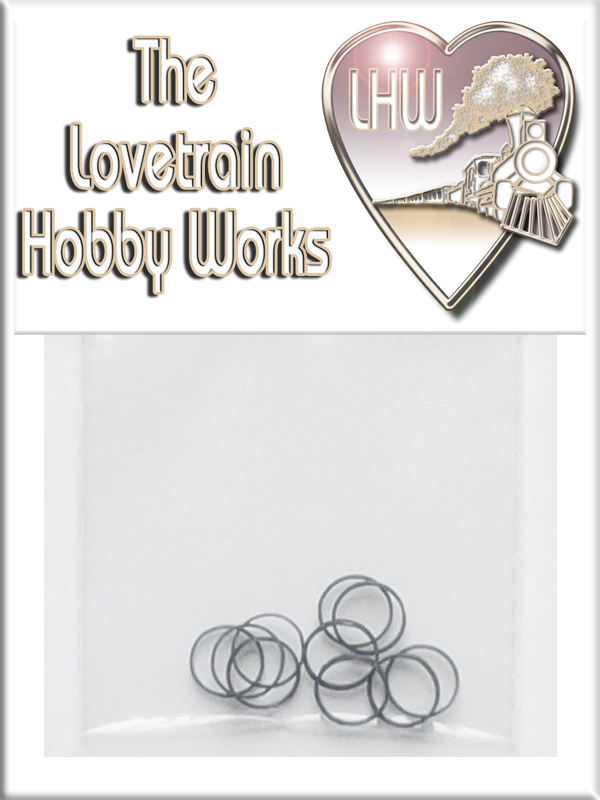 N scale traction tires - Steam-Diesel-Electric Large-Medium-Small Driver Locomotive MEASUREMENTS 6mm, 8mm, 9mm.